Born Jamesetta Hawkins in 1938, the singer who was nicknamed Miss Peaches crossed genres, from blues and rhythm and blues to rock and roll, soul, gospel and jazz. James's singnature song, "At Last," was released in 1961, but is still a romantic favorite — President Barack Obama danced to it with his wife Michelle at the inauguration ball. In 1962, James released "Something's Got a Hold on Me," the opening line of which ("Oh sometimes… I get a good feeling, yeah…") is currently in a chart-topping dance track by Avicii. 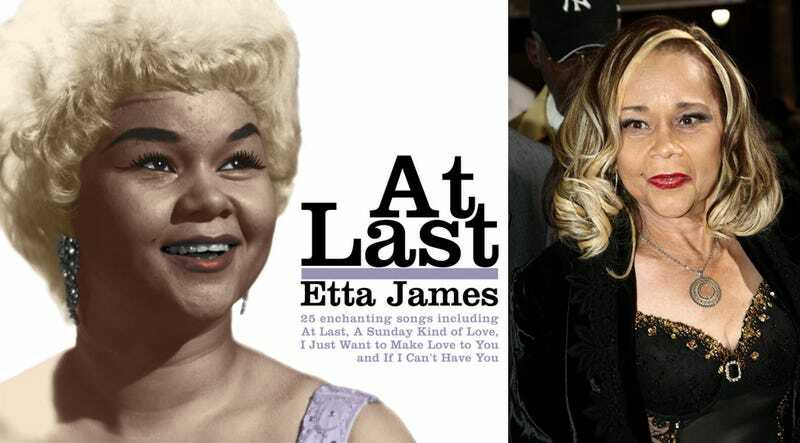 James's time with Chess records was the subject of the 2008 film Cadillac Records, in which Beyoncé played the singer. James struggled with heroin addiction in the '70s, but bounced back in the late '80s and '90s, recording jazz and R&B albums. She won six Grammys, was inducted into the Rock and Roll Hall of Fame, the Rockabilly Hall of Fame, the Blues Hall Of Fame and received a Grammy Lifetime Achievement Award. In April 2009, James made her final television appearance performing "At Last" on Dancing with the Stars; in December of last year, she was declared terminally ill. We lost an epic talent today, but these songs live on. My personal favorite, "Seven Day Fool"